Featured song from the motion picture "Willatuk: The Legend of Seattle's Sea Serpent" featuring Academy Award nominated actor Graham Greene. The song is about the Wonkatila Tribe and how Willatuk saved them during the great quake and blizzard of 1736. 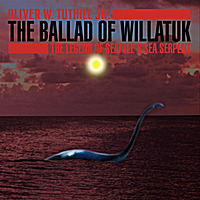 Oliver Tuthill has scored over a dozen films and this song was written for the film "Willatuk: The Legend of Seattle's Sea Serpent" narrated by Academy Award nominated actor Graham Greene. The song describes the legend of the Wonkatila Tribe from Seattle, Washington who in the great blizzard of 1736 became trapped on the ice of Lake Washington and were attacked by wolves who descended from the Cascade Mountains. Legend has it that as a huge earthquake hit a mighty sea serpent that the Indians named "Willatuk" which means "God of Ocean" rose up through the ice and drove the wolves back into the mountains. Willatuk kept the Indians warm by breathing on them and brought them fish so they would not starve.